The ZTE MF283 Office 4G Router is simple to use - simply insert your 4G Data SIM and turn on the power. You now have an office 4G router with 4 x RJ45 Ethernet Ports and WiFi with high speed 4G mobile broadband connectivity so your wired and wireless users can all communicate with each other and access the Internet via high speed 4G services. The ZTE MF283 has just been released and is the first wireless broadband router in the world that supports LTE FDD 800/900/1800/2100/2600MHz AND LTE TDD 2300Mhz AND WCDMA 850/900/1900/2100Mhz which means it works on all 4G and 3G networks with download speeds of up to 100Mbps and access for up to 32 WIFI devices, making it an ideal 3G/4G Router for Small Office use. It takes a single SIM normal size card in its slot. And it has 2 telephone ports for making and receiving calls from a standard handset over mobile. It supports CSFB (Circuit-switched Fallback) so that when calls are made in LTE mode, the device will fall back to 3G mode to allow the call to be handled circuit-switched. (Network mode cannot be set to 4G only for CSFB to work). One touch connection,LED indication display,hassle free,plug and play?? 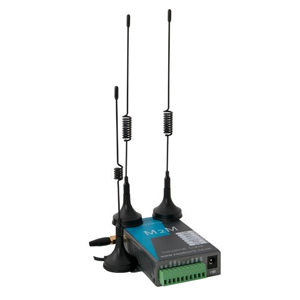 The ZTE MF283 has 2 x SMA Antenna Connectors for the connection of an external 4G Antenna - you would use this option for example if the router was installed in a location with a poor signal but there was a good 4G signal close by - maybe outdoors - so the antenna would be located in the position with the strong signal and this is delivered along the cables to the router. We would recommend something like the Fullband® MIMORAD Outdoor 4G Antenna which has twin cables to connect to the 2 x antenna ports of the router. There is no switch or setting in the router to confirm that you are using an external antenna the router will just recognise that an external antenna is connected. Here is a quick video showing some of the configuration options of the ZTE MF283 to give you an idea about the router functionality. Here is a video showing the test we did with an external antenna connected and without the external antenna connected to demonstrate that the router automaticall detects the external antenna and displays the corresponding signal strength.